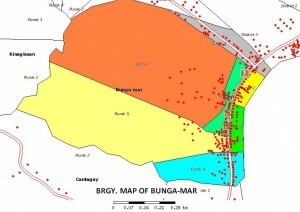 The people of Bunga Mar envision a community that is united, strong and progressive. They can see themselves living a kind of life that is dignified because there are already alternative forms of livelihood activities. The whole community has become a place of refuge and security. Real developments are very evident as seen in their local infrastructure, basic services are always available and no one is complaining for ineffective or inefficient leaders of the barangay. The mission of Barangay Bunga Mar, can be materialized through the combined efforts of the residents coupled by the strong support of the Barangay council, the local gov’t unit, gov’t agencies, non-gov’t organizations and people org. with such dynamic cooperation, fulfillment of all programs will be met especially in the aspect of economy, agriculture, fishing industry, environment, education, culture and arts, infrastructure, and development administration.